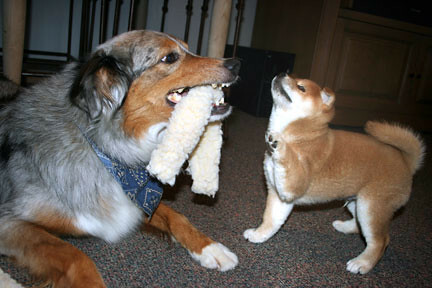 This is a really great website if you want to see how well Shiba Inus age. There are some beautiful dogs here. Most of them are 9 years old or older. And one that is almost 17! Are you bored of pictures of the puppy yet? Tired of me gushing about how wonderful he is? Well, here's one more photo and post of him and then I promise I'll post something of substance. Here's our water dog. We took Timber to the beach today for the afternoon. He can swim pretty well. It didn't take much encouragement to get him in the water. He just followed us in. He's not thrilled with areas with waves. He'd prefer the calmer areas. His favorite thing is picking up shells. 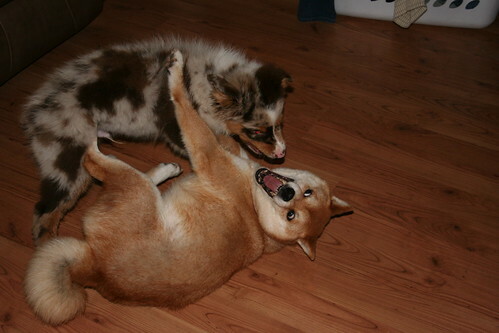 Farley was always the trainer of shiba puppies. He was a good play buddy for them. 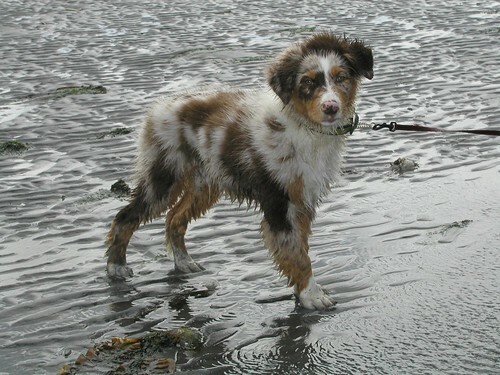 Now with a new aussie puppy, Don Juan has become the play buddy. What a role reversal.